Fans of Eagles music will have the opportunity to check out Runnin’ Down the Road at several upcoming events. It was last August, after months of preparation, that seven local musicians took to the stage to unveil Western New York’s newest, and perhaps only, Eagles tribute band. Performing under the name Runnin’ Down the Road, the heavily practiced group is now ready to kick off another season of music festivals and shows across the Niagara Frontier. Made up of local classic rockers Randy Barnard (lead guitar), Bob Brummitt (bass, vocals), Luke Ciminelli (keyboard, guitar, sax, vocals), Mike Nierenberg (percussion, vocals), Mark Raccuia (keyboard, guitar, vocals), John White (guitar, vocals) and Jubal Myer (drums, lead vocals, arranger, director), Runnin’ Down the Road routinely performs shows that are three hours or longer. Among the catalog of hits they have perfected are Already Gone, Best of My Love, Desperado, Dirty Laundry, Heartache Tonight, Hearts on Fire, Hotel California, How Long, I Can’t Tell You Why, Life in the Fast Lane, Love Will Keep Us Alive, Lyin’ Eyes, New Kid in Town, No More Cloudy Days, One of These Nights, Peaceful Easy Feeling, Please Come Home for Christmas, Seven Bridges Road, Smuggler’s Blues, Take It Easy, Take It to the Limit, Tequila Sunrise, The Long Run, Victim of Love, Walk Away and many others. • 8:30 p.m. to 12:30 a.m. Saturday, April 13 at Herman Kent Celoron Legion Post 777, 26 Jackson Ave., Jamestown. 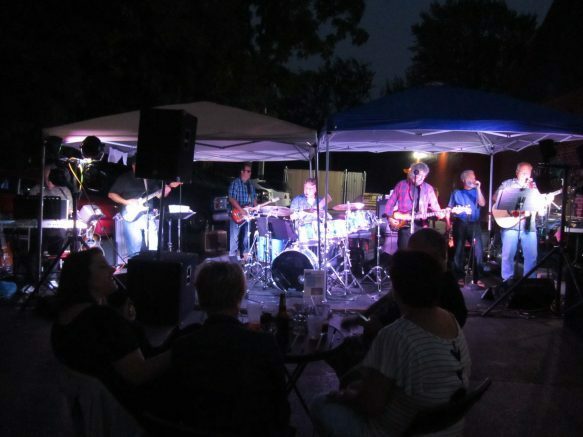 • 6 to 9 p.m. Thursday, June 27 at The Irishman Pub & Eatery, 5601 Main St., Williamsville, where the band made its debut last year. • 6 to 11 p.m. Friday, Aug. 2, Niawanda Park Band Shell, City of Tonawanda, along the Niagara River. For more information and to view video from previous performances, please follow the band on Facebook at www.facebook.com/Eaglestributebuffalo. Be the first to comment on "Eagles tribute band Runnin’ Down the Road is in it for the long run"